I have two Competition Triggers with reduced pre-travel; the Advanced and the Advanced GM. Both have slight external modifications and might not be allowed in some divisions. These triggers will provide a crisp, ultra smooth, lighter trigger pull with virtually no wall. The Advanced Trigger Kits are in the 2lb. range. It is a challenge to reduce pre-travel in a drop-in style trigger and still keep all of the safeties in working order. You can be assured the safeties on all of my triggers have been tested for proper function. These kits are installed in a working Glock where I personally custom tune and adjust each one before shipping. Detailed instructions are included with every kit explaining how to check all three safeties after the kit is installed. All images shown are for illustration purposes only. Actual products may vary due to product enhancements. The Advanced Trigger Kit has been custom tuned and polished for a super smooth and light trigger pull, with virtually no wall and reduced pre-travel… Note: this kit does not come with the Jager striker. The Trigger Group comes assembled and ready to install. Because there are no visible modifications made to the trigger, it can be used for IDPA SSP. 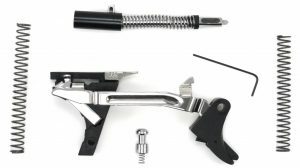 The Advanced GM Trigger Kit has been custom tuned and polished for a super smooth and light trigger pull, with virtually no wall and reduced pre-travel. Additionally, a Jager custom tuned and lightened steel striker/firing pin is included. The Jager firing pin has been modified for the best trigger pull possible and can reduce the trigger weight by up to 4 ounces while adding smoothness and reliability. Disclaimer: When removing pre-travel the individual using this capability must be knowledgeable on how the safeties function and it is their responsibility to keep the safeties working. The Trigger Group and Firing Pin Mechanism are pre-assembled and ready to install. The Advanced Triggers have a pull in the 2 lb. range using a RCBS premium spring scale. This varies due to inconsistencies between individual Glocks. These kits will vastly improve your trigger action. Kits are built within specific tolerances, which will allow them to be interchanged between Glocks of the same frame size.